Immerse yourself in the glorious chaos of all-out war. New maps, more vehicles, weapons and destruction allow you to create your own path and play to your strengths. _New additions - one hit kills with a bolt action sniper rifle! BF3 Maps - BF3 was shipped with 9 maps. The Back To Kirkland Expansion adds 4 to the roster! _ Battlefield 3 is powered by the Frostbite 2.0 engine, which is based on the previous Frostbite 1.5, which powered Bad Company 2. The new engine brings a lot of visual improvements and a lot of optimizations as well. 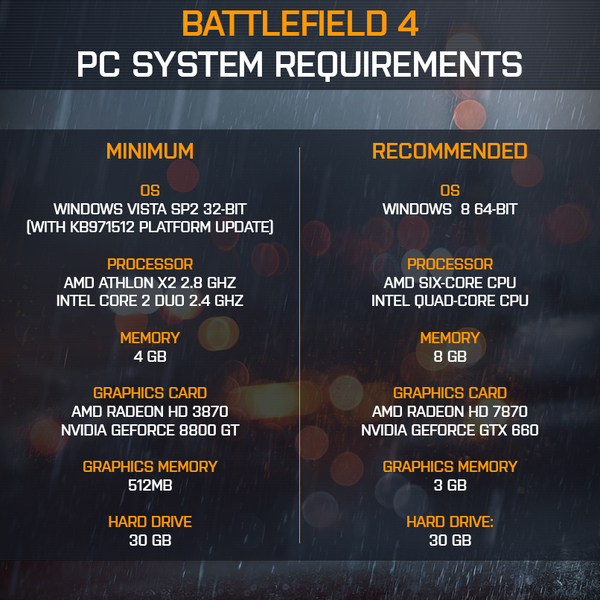 However, please note that Battlefield 3 won’t support DirecX 9, meaning it won’t run on Windows XP. 5 game modes which are playable on all 9 maps. The game modes are: Rush, Squad Rush, Team Deathmatch, Conquest and Conquest 64. Conquest is the classic Battlefield mode where teams battle control flags/capture points on the map. There are two versions of conquest: Conquest and Conquest 64. Team Deathmatch After a long absence from the series, Team Deathmatch is back in Battlefield 3. Squad Deathmatch A popular alternative to Deathmatch, Squad Deathmatch pits 4 squads against each other. Rush First introduced in Bad Company, Rush has become a popular mode in the Battlefield series, and it returns to Battlefield 3. Co-op will make an appearance in Battlefield 3 and will support up to 2 players on a different campaign, set away from the main storyline. List of the four classes in Battlefield 3. Expected to include an assault rifle with grenade launcher attachment. You may revive your downed teammates as well. The kit is also expected to include a knife, pistol, and grenades. Sporting an LMG than can be mounted for better accuracy. A shotgun or sub machine gun. Carries a rocket launcher to take out enemy strongholds and armor. Can repair friendly vehicles that are damaged. Carrying the basic sniper kit plus C4.